Dr. Bronner’s soap probably can be found casually intermingling with almost every demographic in the United States. I’m simply amazed at the scope and breadth this castile soap has established for itself. I don’t know when or where I first encountered this product, but I’ve been using this product for years. And, recently, I’ve been making more homemade stuff. Guess what product keeps on popping up as an integral ingredient — good ole Dr. Bronner’s — the Pope of Soap. Also, Dr. Bronner’s recently upped the stakes by becoming fair trade on their 60th birthday (for example, the olive oil in the soap is a fair trade item from Palestine — Arab-Israeli producers). 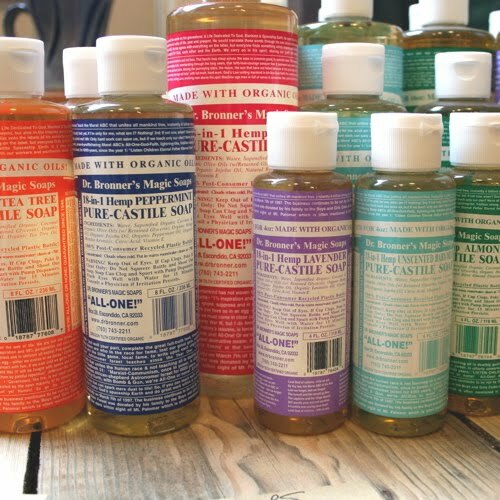 So, in the fashion of the Dave Letterman Show, I thought I’d share my Top Ten Uses of Dr. Bronner’s Liquid Castile Soap! #1 Entertainment — as it is the star of it’s very own soap opera! Also, check out this great interview on Democracy Now! — David Bronner is interviewed on legalizing hemp, GMOs and more! Ok, I feel like I have paid an honorable tribute to this indispensable product. Most co-ops and health food stores normally have this in bulk as well, so you can refill your bottle when needed. Even the standard Walgreens carries Dr. Bronner’s! If you have other uses for this soap, feel free to post!